Ubisoft took a year off to create something familiar. Microsoft gave us the first glimpse of the upcoming Assassin's Creed during its Xbox One X reveal at E3. A day later, Ubisoft discussed the details about how it took a year off from the franchise to "reinvent" the game. Well, after spending some time playing on that newly announced console, what Ubisoft is showing off this week isn't a huge revelation -- it's a continuation. There's no need to dance around the obvious: Assassin's Creed Origins looks amazing in 4K. You've heard us say that a lot this week about games on the Xbox One X, but the visuals really are stunning. The details of ancient Egypt on display here are a pleasure to take in. Sand, textures and other elements are crisp and clear, creating a visually compelling setting for the game. This 20-minute session also reminded me that I should just go ahead and buy that 4K TV. The game doesn't launch until October 27th, so Ubisoft is showing only a few pieces of the story here at E3. My session started in the desert, galloping on horseback toward a small port on the water. The gameplay feels mostly the same as other Assassin's Creed games. There is lots of parkour-style acrobatics, sword-wielding and close-up interaction with the villagers. Because this is indeed a genesis story, you'll be able to see details about where the rituals of the Assassin's Brotherhood came from. The group hasn't been formed at this point because the ancient Egyptian warrior hasn't started it yet. 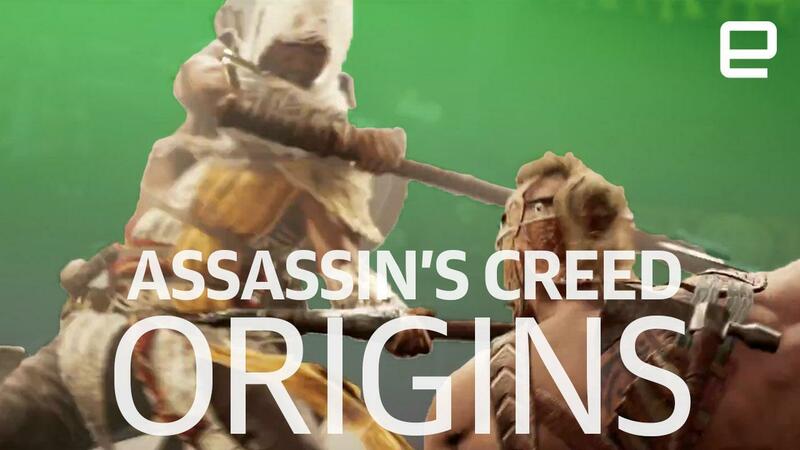 New to Origins is Bayek's ability to summon Senu, an eagle that gives the protagonist an aerial view of enemies without having to scale a wall. 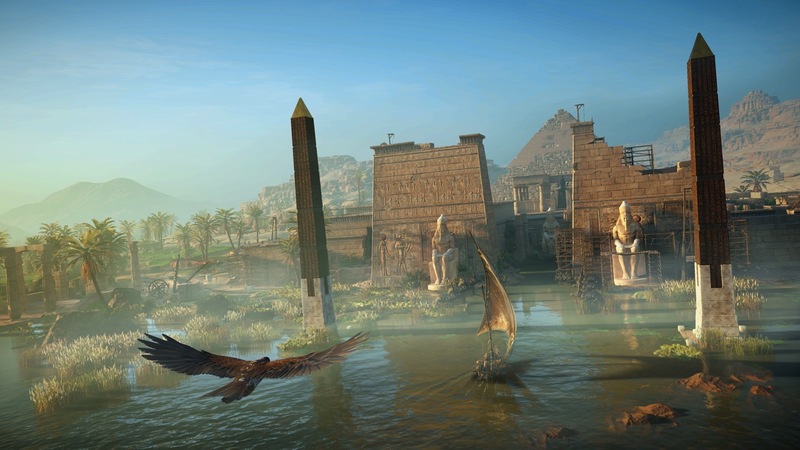 And as you might have guessed, Senu is the living version of Eagle Vision -- a mainstay of other games in the franchise. In a portion of the campaign I played, Senu helped Bayek spot enemies on a couple of boats sitting in the harbor. This allows him to be as efficient as possible when trying to retrieve a couple of items. It's certainly an interesting twist on Eagle Vision, and one that makes a ton of sense for this origin story. I was also able to take on some enemies in the game's battle arena. Waves of fighters come at you, putting those warrior skills to the test. And yes, of course, there's a massive guy you have to take care of at the very end. During this section of the game, the retooled combat system is on display. When you're fighting in Assassin's Creed Origins, you'll need to be a bit more precise with your strikes. Meaning, you have to time blows and their location a little differently to be successful in combat rather than mashing the attack button. Your enemies have this ability, too, which adds a layer of strategy to combat that previous games in the series lacked. The new combat system also harnesses adrenaline to power attacks. Build up energy while you fight and you'll be able to deliver heavier blows. The origin story for the Assassin's Brotherhood and the combat refinements should make this game attractive to existing fans of the franchise. It could also be a solid starting place for newcomers looking to enter the game world in some kind of Star Wars-esque order. And unlike a lot of games being hyped here at E3, Assassin's Creed Origins will be available to play this fall. We don't have to wait long to see if Ubisoft overstated its case, or if this new installment in the franchise really is a rebirth of sorts.